As 2013 wraps up, and especially now that it’s a week before Christmas, I’m sure you’re getting pitches from all directions for products and services to spend your money on. I certainly am. I retweet and share things on Twitter and Facebook and Google+, but that’s just as scattershot. So I’m trying something new that I hope you’ll find helpful. Here’s a list—a curated list, if that makes it sound even better—of projects and products that I think are worth your attention and money at the end of the year. This isn’t a “best of 2013” or a gift guide, which can easily spiral out of control. These are things I believe are valuable, and will give you more satisfaction than just a smile as you open a present on Christmas morning. Become a TidBITS Member. TidBITS has been around since before the Web existed, publishing weekly issues and daily updates covering Apple and the Mac for 23 years. I’ve been an editor since 1997. A couple of years ago, we started the TidBITS Member program to give subscribers of the free publication a way to support what we do. The program has been wonderfully successful, enabling us to pay more writers, bring on Josh Centers as managing editor, and continue to provide a unique perspective on the industry that isn’t chasing Web page views or reacting to silly rumors. That alone is reason to become a member, but there are practical benefits, too: ad-free viewing of the Web site, a 30% discount on all Take Control ebooks, lots of discounts on popular software and services, and more. This year, we tried an experiment that worked really well: my book Take Control of Your Digital Photos on a Mac was serialized in TidBITS first, available exclusively to members. And anyone who became a member then continues to benefit, as TidBITS is currently serializing Josh’s Take Control of Apple TV. Membership levels start at just $20 per year. Buy The Mobile Writer ebook by Julio Ojeda-Zapata. Julio is an ace technology reporter for the St. Paul Pioneer Press who is ahead of the curve about tablet usage: at some point we’ll all be using tablets. This ebook looks at writing and working on iPads, iPhones, Android tablets and phones, Microsoft Surface, and the rest. At $2.99 it’s a steal. Buy MacSparky Field Guides by David Sparks. David (@macsparky) is one of the good guys in the industry, and his Field Guides ebooks are high-quality interactive helpers for controlling email, going paperless, and working with Markdown. Buy Take Control ebooks. Before ebooks really took off, Adam and Tonya Engst started Take Control Ebooks. I highly recommend one particular title (see below), but really, they’re all great. From taking control of iTunes to passwords to iCloud to backups, these guides go deep into the details that matter. And now we get to my books. Part of the reason I’m ganging them up here is because I had a busy year! I want you to purchase everything with my name on them, of course, but here are the latest titles. You can access them all from My Books, where you’ll find links to Amazon, Barnes & Noble, Apple’s iBooks Store, and Peachpit Press. Ordering from this page also kicks a little extra commission my way thanks to affiliate programs. Thanks! Buy my ebook Take Control of Your Digital Photos on a Mac. We’re drowning in digital photos, so how do you get them onto your Mac so you can really enjoy them, and not just forget about them? This guide goes far beyond just importing. It gives you a system for painlessly and quickly organizing your photos on your Mac. 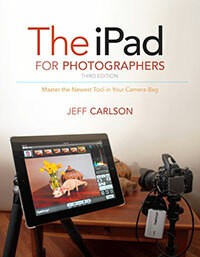 Buy my book The iPad for Photographers, Second Edition. Of all the projects I’ve worked on during the last two years, this is one of my favorites. The iPad is a valuable tool for photographers of all skill levels, whether you’re taking it in the field to review photos (and transfer the images wirelessly from the camera), building a portfolio, editing images, or rating and tagging them. To learn more and download a free chapter, see my companion site at ipadforphotographers.com. Buy my book The OS X Mavericks Pocket Guide. The iPad is changing computing, yes, but the Mac is far from gone. In this latest pocket guide about the operating system that runs modern Macs, learn all about what the computer can do, with lots of tips and tricks scattered throughout. 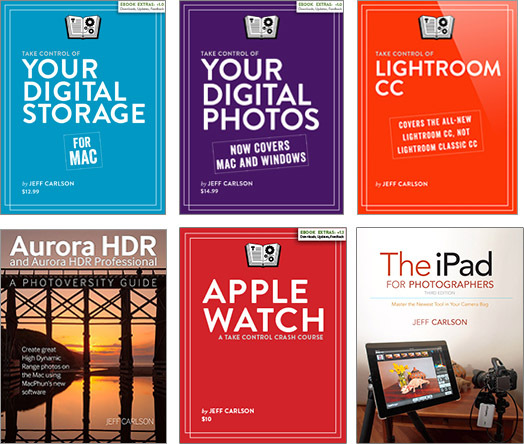 And now, as promised, The iPad for Photographers, Second Edition Ebook Giveaway! The iPad Air book is on Kindle now – it’s $9.99.